I’ve saved over $26,000 in the past 7 months. Even saying that number surprises me because it didn’t feel like I was saving that much at all!. Below is exactly how I saved over $26,000 in 7 months and how you can do it too! The first step I took was to educate myself about all of the different places I could save money. Through my research, I found that I could save money in a 401(k), an IRA, a Savings account, and a Health Savings Account (HSA). I then started automating my savings in each of those accounts. After I increased my income enough to cover my savings, I set up auto-deposits directly into my savings accounts. I highly recommend that approach because then you are not tempted to spend the money. 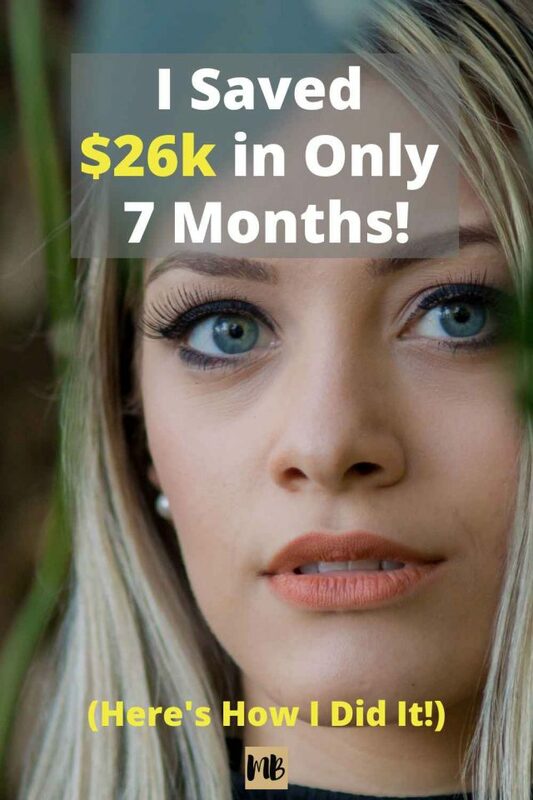 But what if you don’t have the $26k to save? Here are 12 ideas on how to make extra money so you can save more. 1. Get cash back for things you’re buying online with Ebates. Ebates has been a huge money-maker for me! I have $230 in cash back sitting in my Ebates account right now. The key is to download their browser tool so you can see every time you are on a website that offers cash back. And if you refer three friends to Ebates, you can get a $75 bonus. That’s $85 right there, plus all the cash back you will earn with your regular shopping. 2. Sell items you don’t need to consignment shops and on Craigslist. I made $4,500 in April selling stuff I had lying around the house. You would be surprised by how much money you can make with your extra stuff! I sold everything from mugs to frying pans to furniture. It takes a bit of hustle to sell stuff online but once you get going, the feeling is addicting and you can make some quick cash. 3. Track your spending with the free app Personal Capital. And try to stay away from your spending weaknesses! I used to go out to eat every day for lunch and it adds up. Personal Capital is 100% FREE. The net worth tracker is the best part of the whole app. My net worth used to say negative $100,000 but with some dedication and time, it improved quickly. I’m motivated to keep saving when I see it go up each month. Improve your finances with Personal Capital by signing up through this link. (It’s 100% free). 4. Pay off your loans so you can put that money towards savings! I recently paid off nearly $90,000 of debt. It was super hard but so worth it. I now have an extra hundred dollars going to savings each month. If you still have student loans, consider SoFi, which is a company that refinances your student loans (meaning you get a lower interest rate). If you can get a lower interest rate on your loans, you can put more money towards savings each month. To use SoFi, you just fill out a quick survey and it shows you the various refinancing rates you qualify for across different companies. We’ve already helped over 100 readers get better interest rates on their student loans. Fill out the SoFi questionnaire here. I broke down and finally got the Instant Pot after my friends have been raving about it for a year. I hate to say it but I love it too! I’ve been making meals in about 25-30 minutes and batching them for multiple days. Before, I used to get home from work and be too tired to make dinner and then order takeout. Now, I’m making more meals at home. Invest in an Instant Pot here on Amazon. 6. Save when you buy things online with Honey. Honey is a browser extension that automatically searches for coupons when you buy things online. It searches for any code that may be available for you to use and save on your purchase. I was just buying something online the other day and Honey automatically popped up with a coupon and it was awesome! I recently cancelled my DirecTV subscription and now put that money towards savings. No one should be paying for cable TV in 2017 when they don’t have to! You can still get your favorite premium channels by using a service like Hulu for Live TV. It has a sports option with NHL, NFL, etc. which is one of the main reasons people hang on to cable. Check out Hulu for Live TV here. I also have a FIRE TV stick from Amazon. Related: Saving Money with Cheap Alternatives to Cable (Sling TV, Roku, Indoor Antennas). Nothing keeps me more accountable to saving than having to post my numbers online each week. I created this blog in fifteen minutes with Bluehost and chose the cheapest plan they offer. 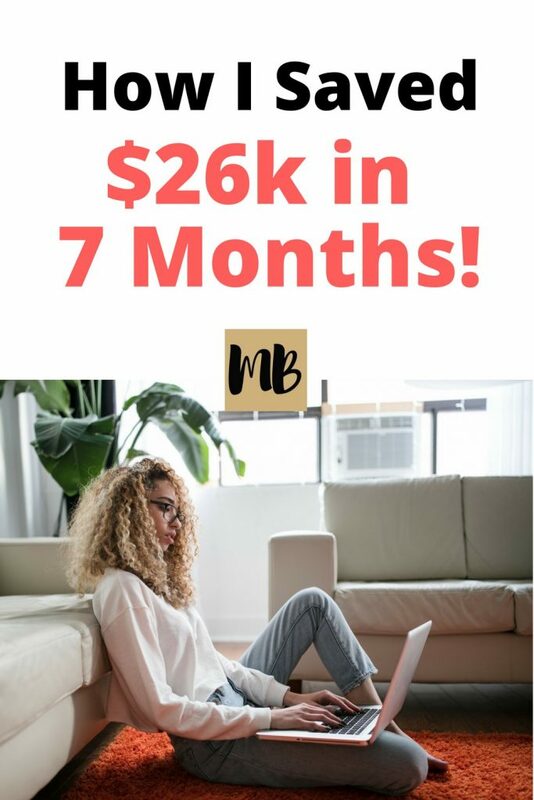 I even made $25,000 last year blogging. If you want to learn more about starting your own blog, check out my free 7-day course, How to Start A Blog Course. At first it was kind of embarrassing to put myself out there on the internet but I’m so glad I did it. Blogging motivated me to achieve my financial goals. I’m also making some extra money on the side from blogging. 9. Apply for new jobs and negotiate your salary. I was afraid the first time I negotiated my salary but it worked! I’m now super confident. Here is my story of how I negotiated my compensation. 10. Have a side hustle! I’m all about side hustles and have a few extra income streams in addition to my day job. The more money you have coming in, the easier it is to save. If you are tempted to buy something, wait 24 hours and see if you still want it. Invite your friends over to dinner instead of meeting out at a restaurant. If you like eating out, try meeting friends for coffee or lunch instead of dinner and drinks. Hiking, going to parks, and going to the beach are all cheap activities if you do them right. 14. Save money on travel by collecting hotel miles and airline points. I no longer pay for flights and hotels after collecting thousands of points. I went on a 10-day trip to Europe with points. I made $550 a month while I was paying down debt by living with a roommate. It wasn’t fun to live with a roommate as an adult but it was worth the money. I was in massive debt two years ago and now I’m aggressively saving as much as I can. I hated living paycheck to paycheck and feeling like I was never going to get out of the hole. I’m saving all of this money now so that I can give my family a good future and so that I can eliminate my stress. I used to get SUPER stressed out about money and I never want to feel that stress again. I recently started a podcast called Fire Drill Podcast so that I could interview people who have achieved amazing things, like paying off thousands of dollars in student loan debt or saving enough money so they could walk away from their jobs in their twenties and thirties. If you like the episode or don’t have time to listen now, I recommend you sign up for the Fire Drill Podcast email list to be notified of new episodes. We’ve interviewed normal people who quit their jobs to travel the world full-time, built six figure side hustles, and other crazy inspiring things. You can subscribe to the podcast on iTunes and listen via the podcast app on your iPhone. How do you save more money faster? Are you contributing to any savings or retirement accounts not mentioned here? Yep, all god vehicles to save money. Congrats. You will definitely find Petsonal Capital both powerful and addictive. On the latter point, of course make sure not to react to the swings of Mr. Market when he has a bad hair day!! Keep investing through up and down swings and you’ll be well on track. I love how detailed and content-packed your posts are! “You can then use the money on whatever you want!” So you can withdraw from your HSA and spend it on anything? Is this once you reach retirement age? I honestly haven’t opened up an HSA though I probably should after reading all these benefits. Thank you! So let’s say in 2016 you go to the dermatologist and you are billed $300. Most people would expect you to use your HSA to pay the bill now. What you could do though is pay the bill from your regular bank account now and save the bill somewhere on your computer. In 2030 or whenever, you can show the receipt and withdraw the full $300 from your HSA. By that time, your HSA has grown exponentially because you never paid taxes on the money going in, you let the money sit tax free in investments and the earnings on them compound, and then you don’t get taxed when you’re pulling the $300 out, because the money was for a qualified medical expense back in 2016. Does that make sense? Check out the Mad Fientist’s post I linked to above because he explains HSAs the best. Ah yeah – thanks for that extra tip on the non-qualified expenses! Ugh I wish I could add after tax money to my 401k. I could contribute to my Roth 401k but then I’d have to dial down my pre-tax contributions. No thanks! Very sound advice all-around, Julie. That’s a pretty nice savings rate over 7 months! Your breakdown of different options is right on target, as well. Nice post! Thank you and glad you liked the breakdown! I had no idea that you could contribute more than the 18k max depending on the plan. 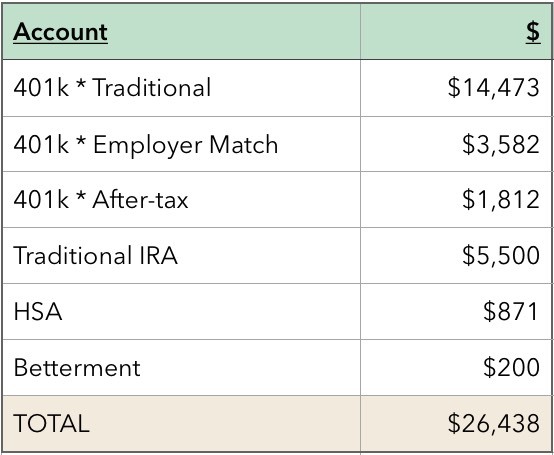 I don’t think I can max out my 401k this year because I started my job mid-year but I’m going to look into contributing more towards my 401k. The thing that I’m scared about is the tax risk that comes out of investing in 401k at the age of 59.5 but I guess I’ll cross that bridge when I come to it! I also like the list, I’m looking to increase my income and mystery shopping isn’t particularly big where I live. I’m going to look into Fiverr and freelance writing! The tax risk that comes out of investing? What do you mean? If you mean what I think – Do you read the Mad Fientist or Go Curry Cracker? Check out the Roth IRA Conversation Ladder. That strategy is used to access your 401k prior to normal retirement age (you have to roll it over into an IRA and then Roth IRA). True but now they are taking 10 percent or more from the ira for the people that does not work can have money to retire on . Don’t think its right for us working people. But nothing we can do. Ooh mini early retirement – I like the sound of that! Also, congrats on saving some of the cash! That’s impressive! The big win here is that your 401k after tax money can be rolled over into a Roth IRA upon quitting your job. By using this trick, Investors don’t need to be held to the $5,500 annual IRA investment rule. Yup! Super exciting! Love that I can contribute to a Roth still. Good stuff, my company doesn’t match 401k contributions but I got them to add Vanguard options a couple months ago! I’ll be maxed out this month and focus solely on after-tax. Yay for saving money! Hell yeah! Who says you can’t save in the Bay! I don’t know where to begin. Julie, you’re a freakin’ financial rock star. Awesome job. I’ll just comment on the HSA. This is the greatest saving vehicle known to man. Triple tax free! Money goes in tax free, accumulates interest tax free, and is withdrawn tax free. I started my HSA less than three years ago and I have nearly $11K in it. Imagine if I could have contributed to it for ten or twenty years. So if one is relatively healthy, and has access to an HSA, one would be foolish not to take advantage of it. Thanks again, Julie, for this awesome post. I’m definitely sending the link to my saving-challenged nephew. Great job, but a couple of strategy questions. I’m confused as to why you contribute after-tax dollars to your 401k as opposed to a taxable brokerage account? Are your plan options exceptionally good? Just curious as to why you would make it harder to access money for business opportunities. Also, curious on your decision to go with Betterment. Their funds are no better than Vanguard’s, it’s simple to do the tax-loss harvesting yourself, and they may be unable to do it for you unless they manage your 401k also. 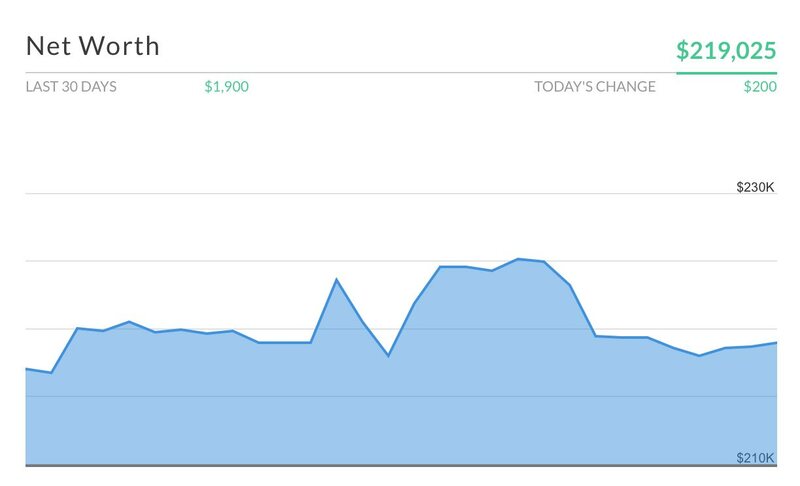 In this experiment Vanguard came out ahead: http://www.mrmoneymustache.com/?s=betterment. Vanguard has my IRA contribution. Re: Betterment, I’m not sure everyone agrees it’s simple to do the tax-loss harvesting yourself and that is not the primary reason I use them. It was really easy to get my money into Betterment, they have great customer service (and immediate which is key for me), and I wanted to try a robo-advisor especially one with low fees. I hope to get to the threshold ASAP which drops the fees significantly. Hope that helped! BTW – I’m an MMM reader too. Great, life changing stuff. What you don’t say anything about is your monthly income or your employer in this post — so don’t go touting your monthly savings without giving us the full picture. Be honest. How much do you make and what are your other expenses? I would like to know that. This isn’t the “anyone can do this plan.” This is the I work in corporate america and make bank plan. True story. Completely agree. My other posts tell exactly how I got the well-paying job which I used to pay off debt aggressively and save! There was a strategy to it and I believe it’s a repeatable strategy for anyone willing to do what it takes to climb the corporate ladder. Sounds like you’ve done a lot of research and really utilized your findings to your advantage! 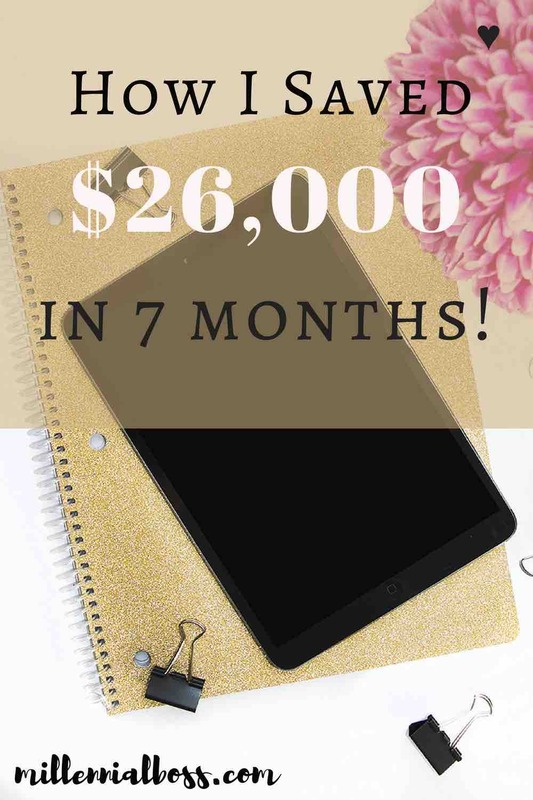 That amount of savings in 7 months is quite the feat for nearly anyone, so congrats on that! It does seem like there are better ways you could have split your savings amongst the different vehicles in order to maximize your tax savings not only now but in the future as well, when you’re in higher tax brackets (of course under the assumption that your income and assets increase rather than decrease over time). This is a great resource, and your links are so helpful! My biggest problem is that even doing surveys and doing extra jobs, I still don’t make enough to save much… But then, once I look at how much of my money goes to Bubble Tea… well, you get the point. I shall try, though! These are great tips. I’m a huge fan of selling stuff you’re not using. True story – I once sold a package of frozen baked potatoes on a Facebook yardsale site. I was cleaning out the freezer and they had come with an Omaha Steaks gift box someone sent us; my husband won’t eat them and I wasn’t going to eat them by myself, so I listed them on the yardsale site and sold them for like $10! I just loved the 24 hour rule practice. Thanks for sharing the amazing tips! And yes, I really appreciate the way you have made yourself debt free. Happy blogging!